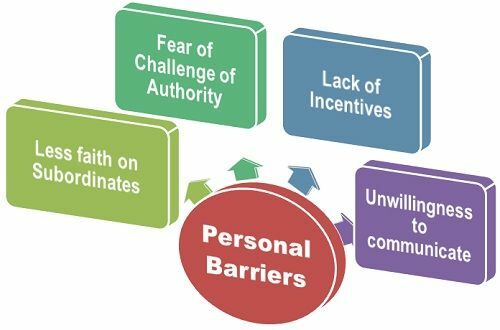 Definition: The Personal Barriers relate to the factors that are personal to the sender and receiver and act as a hindrance in the communication process. 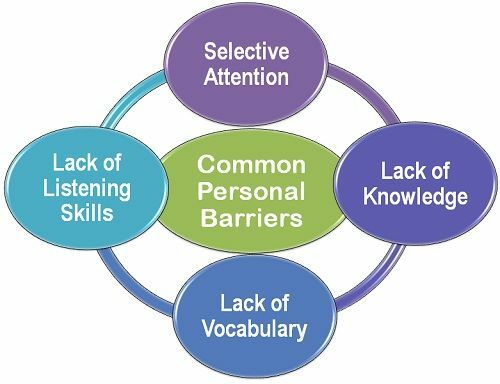 These factors include the life experiences, emotions, attitudes, behavior that hinders the ability of a person to communicate. Lack of Listening Skills: The efficiency of communication process gets disturbed when the receiver listens only with ears but do not apply his mind. Often, the receiver listens what he wants to listen and give no attention to other aspects of the information, thereby acting as a hindrance to the effective communication. Selective Attention: This problem arises when the person is impatient and put his objective above all. He gives ears to only that part of the information which is helpful for him and fulfills his objective and ignores all the other aspects. Lack of knowledge: Also, the communication process suffers if the sender and receiver have less knowledge about the subject matter. Lack of vocabulary: Often, the communication problem arises when the sender uses some words which are difficult for the receiver to comprehend correctly. Less faith in subordinates: Often, the superiors have a lack of confidence in the subordinates and, therefore, doubt on their capacity to provide relevant information. They deliberately ignore the suggestions and recommendations from the subordinates and discourages them to further communicate. This lowers the morale of the employees and hinders the communication process. Fear of challenge of Authority: There is a fear in the minds of the superiors that if they will not perform in line with their authority, they will be demoted to the lower levels. And, thus in order to maintain their level they intentionally hide their weaknesses by not communicating their ideas to others. Lack of Incentives: Often, the subordinates give their suggestions and recommendations with an objective to earn incentives. The incentives are given to the subordinates to motivate them to give suggestions and to acknowledge their suggestions as important for the success of the organization. If there is a lack of incentives, then the subordinate is not likely to communicate and hence the communication process gets adversely affected. Unwillingness to communicate with the Superiors: Often the subordinates do not communicate with their superiors with an intention to conceal the information which is of a negative nature and can have an adverse effect. If the subordinate is required to inform his superior then, he modifies the information in such a way that it does not have a negative impact. Thus, by not providing the information in its actual form, the communication process is tempered. Thus, there are several personal factors, varying from person to person, influences the communication to a great extent and might obstruct the purpose for which the communication was intended.